Will Oil and Natural Gas Prices Reconnect? HomeBusinessWill Oil and Natural Gas Prices Reconnect? Donald Marron is an economist in the Washington, DC area. He currently speaks, writes, and consults about economic, budget, and financial issues. Before his government service, Donald had a varied career as a professor, consultant, and entrepreneur. In the mid-1990s, he taught economics and finance at the University of Chicago Graduate School of Business. He then spent about a year-and-a-half managing large antitrust cases (e.g., Pepsi vs. Coke) at Charles River Associates in Washington, DC. After that, he took the plunge into the world of new ventures, serving as Chief Financial Officer of a health care software start-up in Austin, TX. After that fascinating experience, he started his career in public service. Donald received his Ph.D. in Economics from the Massachusetts Institute of Technology and his B.A. in Mathematics a couple miles down the road at Harvard. 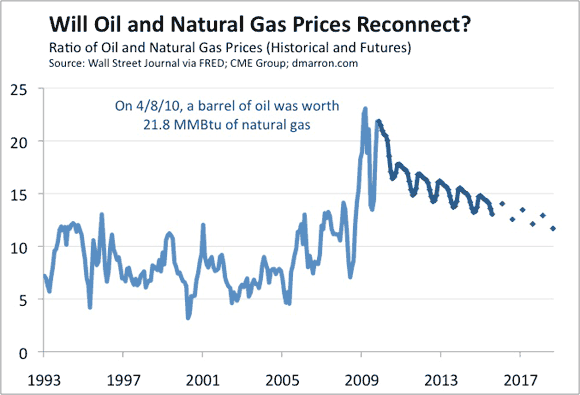 1 Comment on Will Oil and Natural Gas Prices Reconnect?